Olympia, WA: Chalking Dissent of Bank of America! 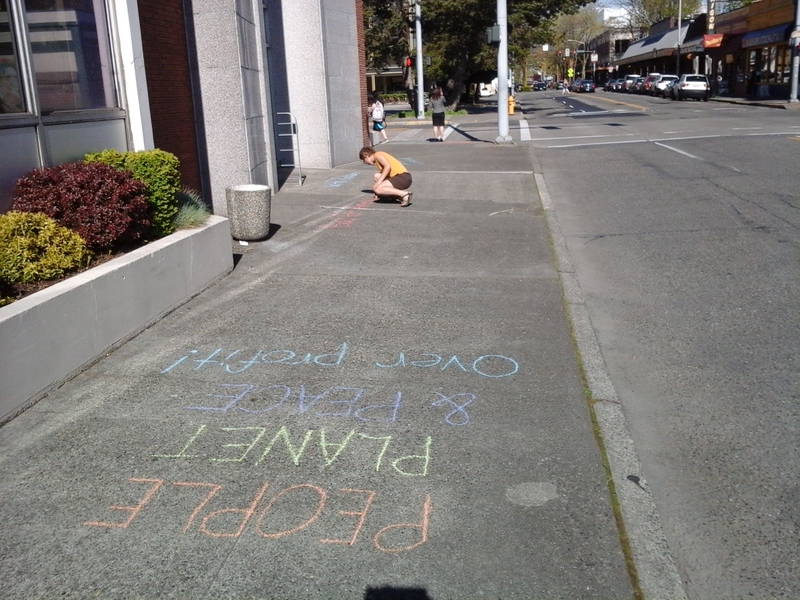 Home > 2014 > April > Olympia, WA: Chalking Dissent of Bank of America! Bank of America is what? That’s right, bad for America. 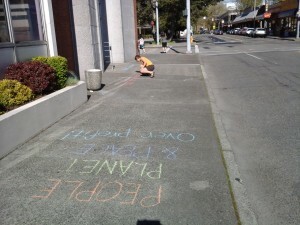 We were chalking up the sidewalks around the B of A as well as holding signs, chanting, passing flyers and bannering. 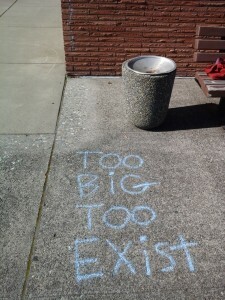 We’re trying to make sure B of A keeps their extra security guards employed that were hired since Occupy Olympia and Olympia UNCUT started targeting them as local fiends for the transnational globalized capitalist class. There are alternatives to Wall Street Banks, most communities have a local or regional bank, some have credit unions and then there are more radical alternatives like Bitcoins. We are well aware that the branch level employees and the customers of the bank itself are not our enemies at all. 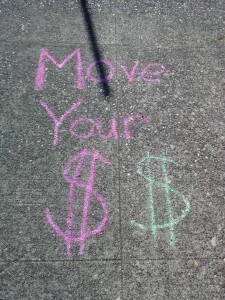 Often there is no choice about where you have to bank and we all have felt the need for work. In as much as they may not have a choice, they can be our allies on the inside and friends. 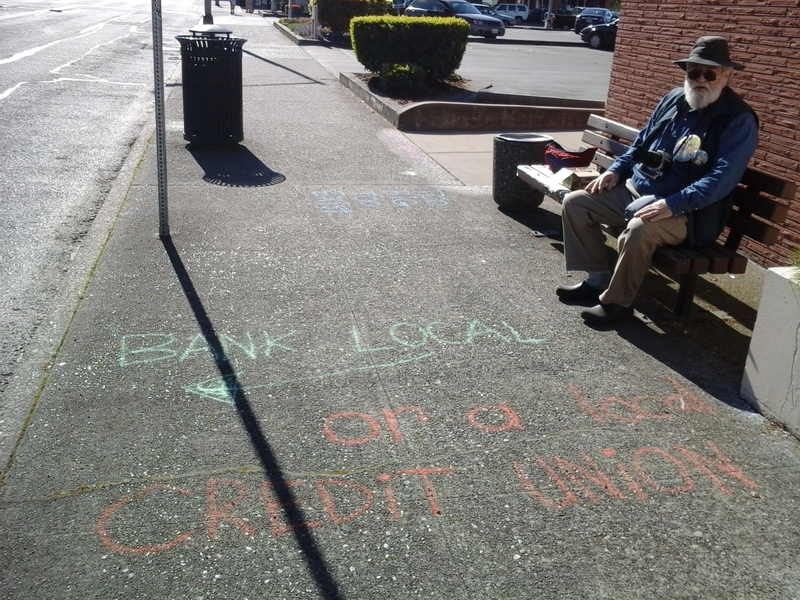 Of course we do want to shut down the bank, which will be an inconvenience for them, but we will do our best to support their transition by supporting more jobs, benefits and the growth of credit unions. 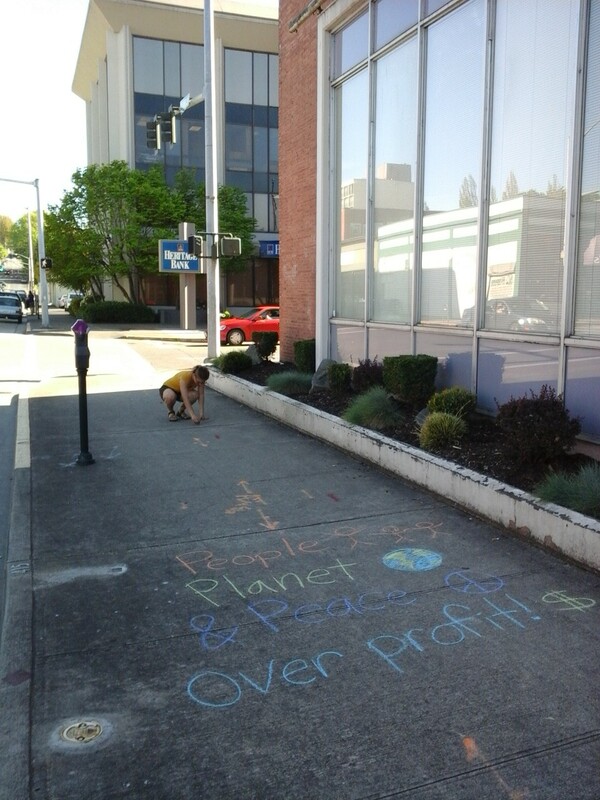 We have found in Olympia that 1-4 people can be more effective then 50 when it comes to the long term organizing work of shutting down the banks. 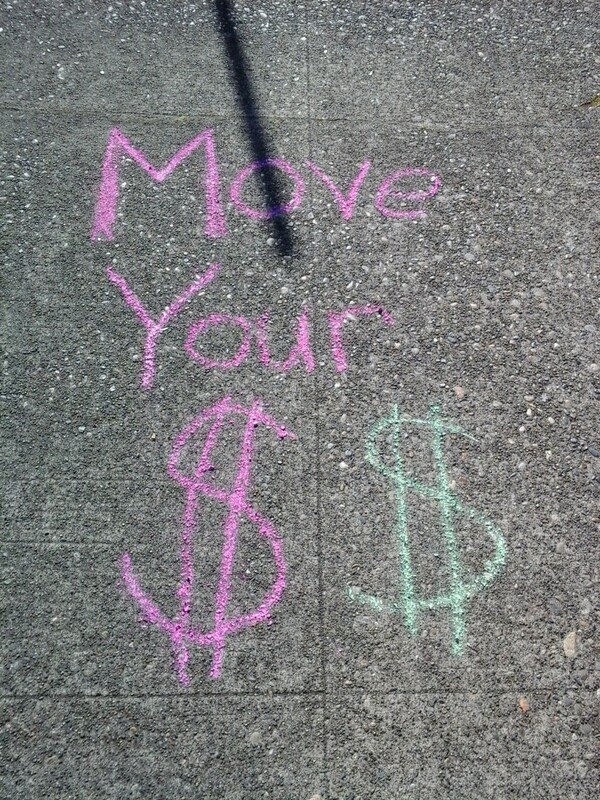 We want people out there more often rather than in more numbers. 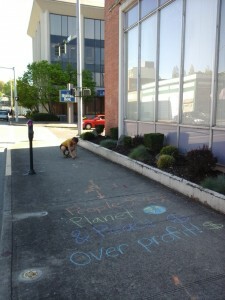 Big protests are totally fun, but they can be intimidating to the folks we are trying to reach. 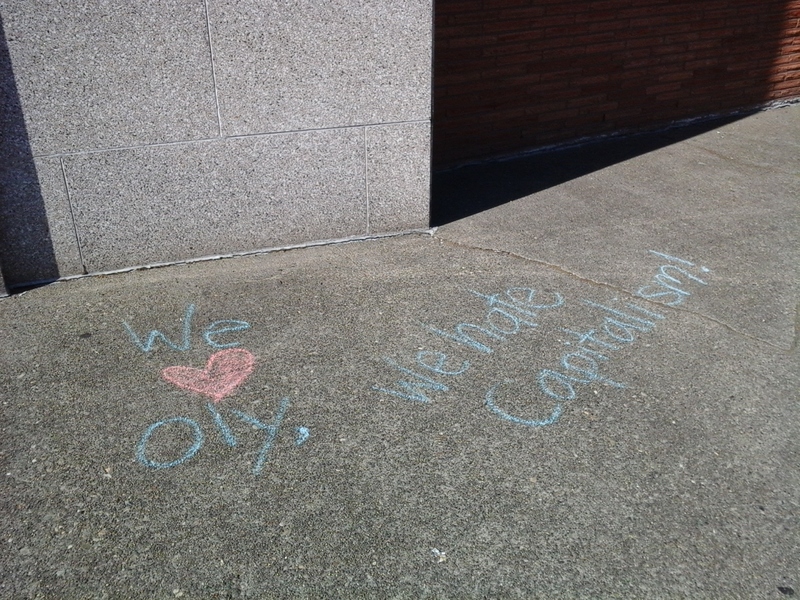 We keep our messages polite and engaging while still speaking the radical truth about the systemic problems of capitalism. We meet folks where they are at and we engage them in effective communication rather than shaming. These are members of our community and we are for building that up.